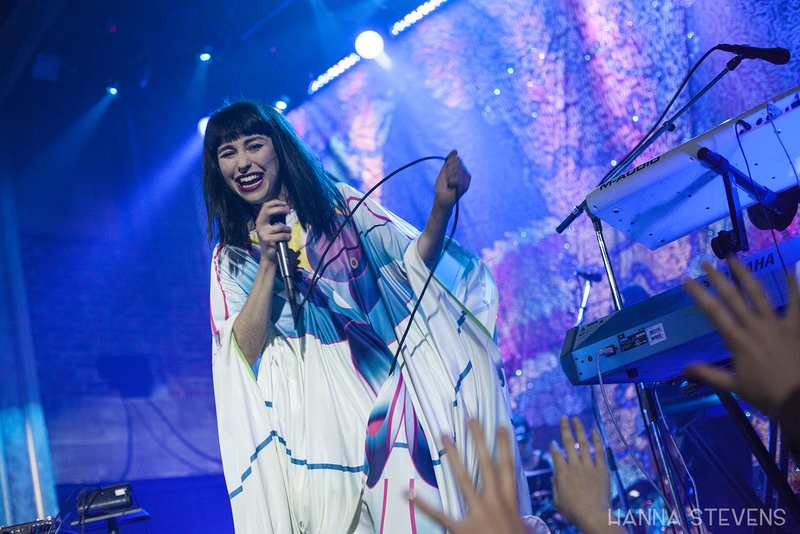 Kimbra exuded energy and exuberance at the Neptune Theatre throughout a visually spectacular performance on April 13. Mikky Ekko relied on his songwriting and vocal abilities, making for a strong opening performance. Their aesthetics were extremely different, but they shared a powerful sincerity in the real-time delivery of their lyrics. Kimbra, who had performed at Coachella a few days earlier, took the stage in giant metallic platforms and a robe decorated with an abstract design of a woman’s body. Between the flowing robe, glittering backdrop, and Kimbra’s siren song, her show felt like a magical mermaid cabaret. She sang and danced with seemingly limitless energy, accompanied by her four-piece band. Red stage lights hauntingly illuminated Kimbra’s performance of “Rescue Him.” In the song, Kimbra cyclically rescues an undeserving lover, knowing that everyone else sees futility in her tireless forgiveness. “Rescue Him” is of darker subject matter than many of Kimbra’s other compositions, and is reminiscent of Amy Winehouse’s lyrical themes throughout her record Back To Black. Beyond the usual stage lights, Kimbra is known for visually exciting theatrics. The spectacle included a floor-to-ceiling backdrop – an enchanted forest with glittering spider webs, birds, and tangled vines – originally designed by Thom Kerr for her 2012 US tour (learn about the creative process on Kerr’s blog). Kerr has been involved with Kimbra’s visuals in various capacities, including photography for The Golden Echo. Amidst the busy stage, a spotlight refocused the audience’s attention on Kimbra during “Goldmine,” a determined song of self-sufficient independence and mining magic out of darkness and pain. “Love In High Places” highlighted Kimbra’s immense vocal talents, as her tone and precision commanded the more down-tempo piece, a nice contrast amidst the sonically saturated set. Kimbra’s recorded music can be quite busy with complex layers of production, which makes sense given her expertise in instruments, electronics, and recording software, not to mention contributions from her numerous collaborators, including Thundercat and Bilal. 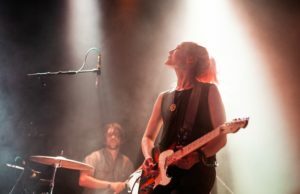 However, her live show allowed more space to improvise vocally, sing behind the beat a bit, and deliver her lyrics conversationally and emphatically, thanks to vocal support from her band and her vocal harmony tracks. Guitarist Timon Martin began the well-earned encore. Kimbra joined him for an extremely sincere performance of “Waltz Me To The Grave,” a song that acknowledges death and possibilities that accompany transformation. The rest of the band took the stage, and as Kimbra faced them with arms extended, she led the song’s 7/4 riff, building tension and then landing in a gentle and welcome release (see a similar performance a week prior in San Diego here). Sky-rocket singer Mikky Ekko did not employ visual elements, and had no need for them. 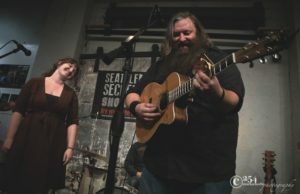 His set found strength in his remarkable range and fierce falsetto. He proclaimed love for Seattle, realizing aloud that this was his third time in Seattle in five months. He came across sincere, and compared the familial quality of his band to the connection he wanted to make with the audience through his songs. Song highlights included “Comatose,” “Time,” and “Stay,” which Ekko co-wrote and recorded as a duet with Rihanna. 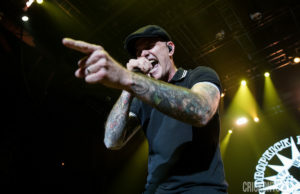 He grabbed the hands of screaming front-row fans and said, “This is a song for . . . you,” kicking off his song, “U.” And, as for that octave vocal jump during the last chorus, it was even more powerful live than on his 2015 release Time. He closed with “Smile.” The uplifting and anthemic chorus held a different weight live as Ekko delivered the dark and cynical lyrics, his eyes burning from sweat as he gave every last ounce of energy through the final note.